Koh Chang diving is a busy and vibrant scuba scene with many different sites, good well-run companies and plenty to see, including the wreck, HTMS Chang, recently sunk, sitting pretty and accepting both fish and divers. 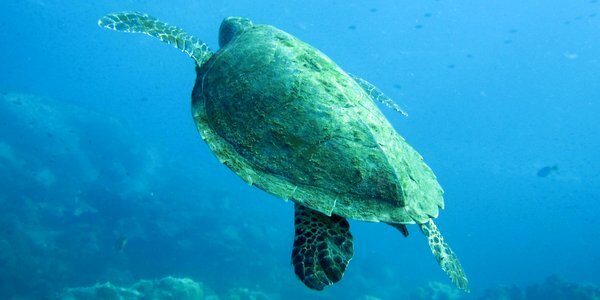 The diving runs throughout the year, but the best time is from November through to May when the seas are calmest and visibility is usually very good, 10 metres at least but often more. 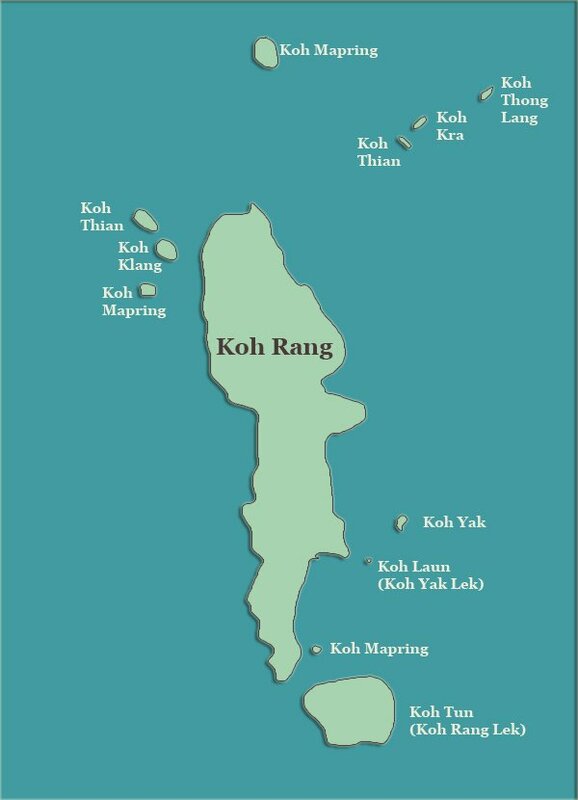 Koh Chang’s lack of strong currents or great depths make it a great place to learn to dive or to refresh your skills. We are able to help with all your diving questions, so you can prebook your day or days – please just use the Contact Us form and indicate your dates, what you would like to do, your level and we will get back to you with our suggestions, best company to meet your needs and prices. 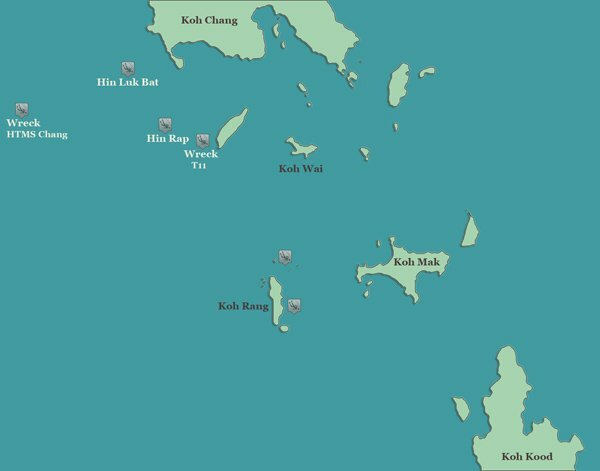 The principal dive sites are the rocky formations of Hin Luk Bat, Hin Rap, Hin Nam Tai (Blueberry Hill), Hin Rua Tek (Banana Rock), Saam Sao Hin, Hin Rap North which all lie 3 to 5 kilometres south and south west of Koh Chang. Down in Marine Park itself at Koh Rang, the sites and reefs include The Pinnacles (Hin Daeng Ga), Koh Yak and Koh Laun, Koh Thain West and Kuak Hin Ma (3 Finger Reef). Depths range from 8 to 30 metres with the usual dive time at 1 hour. HTMS Chang, sunk in November 2012 around 5km off the coast of the island, is, at 100 metres, the largest diving wreck in Thailand. It sits upright in 30 metres of water, with the main deck at 20 metres. It is suitable for all qualified divers, with Open Water able to dive around the tower, the captain’s cabin, above deck and the gun turrets, whilst Advanced can go deeper with some very good swim-throughs. All the companies offer Nitrox and wreck speciality courses. Staghorn, Christmas Tree, Table, Gorgonian Fans and Soft coral are found across the sites, with fish, often seen in large shoals, ranging from Moray Eels, Groupers, Trigger, Barracuda, Angel, Clown, Porcupine to Stingrays, with plenty of Nudibranches and Sponges, Sea Turtles and the odd Whale Shark. 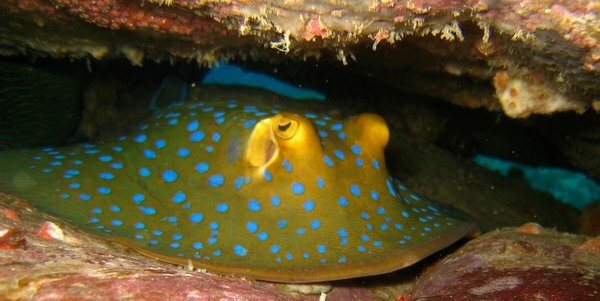 For a detailed guide to all the dive sites, please do have a look here at BB Divers round-up. Prices are consistent across the companies with little aggressive undercutting but companies do offer deals on courses, multiple days of diving, groups and accommodation and prices might go down a little at the end of the main tourist season or during the rainy season. Prices also vary slightly on location, with dives more expensive down at the Marine Park in Koh Rang, simply because it is further. Pool dives are used for instruction as needed during the courses. Owned by Belgian, Kristel, senior Koh Chang dive shop with 10+ years experience. Wooden boats, pool in Lonely Beach, professional staff, well-maintained equipment, cited as benchmark company. 5 Star PADI IDC, wreck diving. 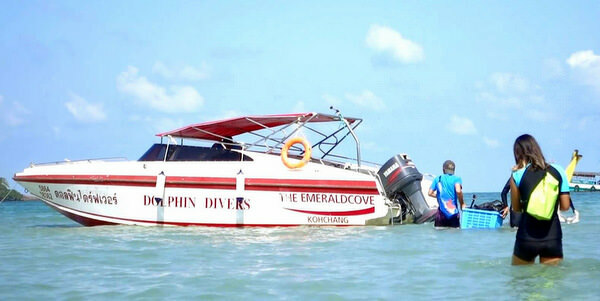 Very competitive pricing, couple of boats, all courses, wreck diving, friendly and professional. Based at Cliff Cottages in Bang Bao. Busy and popular, not just for price. PADI, RAID, DAN, Gold Level Instructor. PADI 5 Star Dive Resort center, Dutch owned popular school which teaches all courses, wreck diving. Have their own boats, well maintained equipment, Nitrox compressor, air testing. 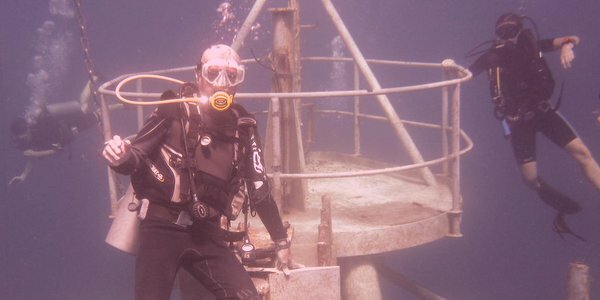 Run by experienced UK diver. All courses taught, fun dives, DAN, wreck diving, reef check and kids programs. As is normal with the smaller companies, hop on the larger companies' boats, an arrangement that has no effect on the customer. 5 years on Koh Chang, Swiss owned company with branch in the Emerald Cove. All courses taught, fun dives and accommodation offered for duration of courses, with 5 star PADI Dive Resort accreditation. Speedboat. New kid on the block, Thai dive shop, with Papa Jack offering lots of local dive experience. All courses available, fun dives. Small and friendly outfit. Share boat. Other small operations include OK Diving, Thai owned with western instructors, southern end of Klong Prao Beach and the Finnish Kontio Diving, same area, not always open. Dive Supply, just up the hill from the Koh Chang Post Office in Pearl Beach has all the equipment needed, well stocked with the top brand names.